This upset the Yahudim because they could see the acrostic message containing the Name, Yod-Hay-Uau-Hay. In one sense, Pilate had posted that Yahusha of Natsarith is "King of the Yahudim," but more literally he had written the true IDENTITY of the body hanging before them. He is YAHUAH. Only Alahim can forgive sins. He will not give praise due to Him to another, YashaYahu (Isaiah) 42:8. We can only pray to Alahim. Can we pray to Yahusha, and will He hear us? The Ruach ha'Qodesh is the Spirit of Yahusha. The Ruach ha'Qodesh has blood? Yes, because His identity is Yahusha, Who made all things seen and unseen. Yahuah as our Deliverer is the Name Yahusha - the "sha" suffix refers to deliverance. (YAHU + SHA) This Name fully translated is "I am your (YAHU) Deliverer (SHA)." The Ruach ha'Qodesh has blood? Yes, because His identity is Yahusha, Who made all things seen and unseen. "See, He is coming with the clouds, and every eye shall see Him, even they who pierced Him. And all the tribes of the Arets shall mourn because of Him. Yea, Amn." "Yea, Amn" literally means "Yes, absolutely, truly." Aman and Amanah are related words, both imply TRUTH. Aman literally means "truly." "'I am the Alef and the Tau, Beginning and End' says Yahuah 'Who is and Who was and Who is to come, the Almighty'". Revelation 1:7,8. Yahukanon (John) turned to see Who was speaking. It was Yahusha (aka: Yahshua, Yehoshua, Y'shua, Yahushua), standing in the center of 7 lampstands, the menorah. The phrase 'Who is and Who was and Who is to come' is the definition or meaning of the Hebrew word, "YaHUaH" (yod-hay-uau-hay). It means existence in all three tenses - past, present, and future. The "alef and the tau" which Yahusha referred to is seen in the Hebrew text of the Torah, and has been a mystery; translators have not known what to do with it. These two letters occur frequently next to the Name Yahuah in the texts, making Yahusha's words a true revelation - Yahuah is Who He is. Who can forgive sins? Only Alahim Yahuah, the Almighty (Al Shaddai) surely. The pope cannot forgive his own sins, yet people believe he has the authority to forgive others their sins. The authority to forgive sins -- or atone for them -- must be seriously considered and kept in mind as we study this sensitive topic. Since Yahusha came, there has been controversy among His students/followers regarding Who He is. Yahusha raised the dead, and He also claims to have raised Himself: "Destroy this Temple, and in three days I will raise it up." Yn. (John) 2:19. This may seem to be a conflict, but not if you understand Him, and Who He really is, and what the words might mean. Galatians 1:1 states that Father Yahuah raised Yahusha from the dead. Titus 1:3 states that Alahim is our Savior, just as Yasha Yahu (Isaiah) 43 informs us. The Torah is His Word, and the Scriptures themselves are about Him. If you have Him (Mashiak Yahusha), you have the Father also, so we see Scripture teaches. Does that mean there are two persons involved, or just one? If we don't solve the equation, no harm is done really. This short study will take many components or hints from Scripture, and reduce them to their simplest form, and probably cause many to dispute back and forth over various texts and translations. We will all wrestle with this until we are clothed with immortality. There is a Spirit at work in believers, and this Spirit is Yahusha of Natsarith, the Mashiak. He is the Paraklita, the Helper. By His indwelling we have power to obey His Commandments. There is a mystery concerning a knowledge of Mashiak. Ephesians 1:17,18 tells us our knowledge of Him (Mashiak) is given to us by Yahuah, as a Spirit of wisdom and of revelation in the knowledge of Him. Colossians 2:9-12 tells us: "For in Him all the fullness of Deity dwells in bodily form, and in Him you have been made complete, and He is the head over all rule and authority; and in Him you were also circumcised with a circumcision made without hands, in the removal of the body of the flesh by the circumcision of Mashiak, having been buried with Him in baptism (immersion), in which you were also raised with Him through faith in the working of Alahim, who raised Him from the dead." A circumcision is called a Brit, and this Hebrew word means COVENANT. The preceeding text says that Alahim raised Mashiak from the dead; yet, we know that Yahusha said HE would raise Himself after 3 days. Could He be Al Shaddai, Alahim Yahuah? He said "I and My Father are one." Yn. 10:30. The mystery, or secret, to be proclaimed among the Gentiles, is "Mashiak is in you" - Col. 1:27, Philippians 2:13, 2 Yn. v.9. This requires omnipresence. Other texts which declare this are at 2Cor. 13:5, Gal. 2:20, and Eph. 3:17. The Shema (Debarim 6:4) declares Alahim Yahuah is ONE. If He were multiple personalities, He would tell us. There is only one Alahim, and Alahim descended to become a man. He told us that's what happened at Hebrews chapter 1. "I am the way, and the truth, and the life; no one comes to the Father, but through Me." Yn. 14:6. "Have I been so long with you, and yet you have not come to know Me, Philip? He who has seen Me has seen the Father; how do you say, 'Show us the Father?'" Yn. 14:6-9. 2 Cor. 5:19 tells us Alahim was in Mashiak to reconcile us to Himself. 1Yn. chapter 3 discusses the operation of the Spirit in believers -- and this Spirit is only given to those who obey Him (Acts 5:32 -- Ruach ha Qodesh dwells in us). The Spirit comes in the Name of Yahusha. Omnipresence is required in order to accomplish this. Yahusha told us that He is the Life, and He said the Comforter (Paraklita), the Ruach ha Qodesh, would be sent to guide us into all Truth. Yn. 6:63 tells us that it is the Spirit Who gives us Life (and this Spirit is the Spirit of Yahusha of course). 2 Tim. 1:14 tells us that this Spirit dwells in us, making the Spirit everywhere at once. Yahusha told us that He and His Father would come to us -- and live in us (Yn. 14:23). "the Father is greater than I", we stumble. That's fine. However, if we can accept Hebrews 1, the Son is the vessel brought into existence in human form through which Father Yahuah manifested Himself to His creation. Amanuel, Prince of Peace, Everlasting Father, Mighty Alahim ~ these all refer to ONE Being; but there's much more to consider. At Revelation chapter 1 quoted above, we find the One speaking calling Himself the Almighty, the "living One; and I was dead, and behold, I am alive forevermore." Micah, the prophet, at 5:2 tells us that Bethlehem Apfrathah would have One "go forth for Me to be Ruler in Yisharal. His goings forth are from long ago, from the days of eternity." There is only one eternal Being, and He tells us there is no one beside Him, and identifies Himself as the first and the last (Yasha Yahu 41:4, 44:6). "I, I am Yahuah, and besides Me there is no Savior." (Yasha Yahu 43:11). 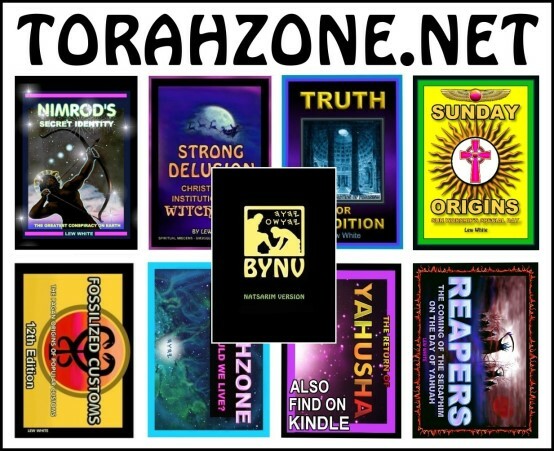 ZekarYah 14 tells us about the return of Yahusha to Earth; the text describes the "Day of Yahuah" and how Yahuah will gather "all the nations against Yerushaliyim to battle." "Then Yahuah will go forth and fight against those nations, as when He fights on a day of battle. And in that day His feet will stand on the Mount of Olives . . . and Yahuah will be King over all the Arets; in that day Yahuah will be the only one, and His name the only one." "And it will come about in that day that I will set about to destroy all the nations that come against Yerushaliyim. And I will pour out on the house of David and on the inhabitants of Yerushaliyim the Spirit of kasid (favor) and supplication, so that they will look on Me whom they have pierced, and they will mourn for Him as one mourns for an only son, and they will weep bitterly over Him, like the bitter weeping over a first-born." The omnipresence of Yahusha's Spirit was evidenced in how He healed the synagogue ruler's daughter from a distance. He didn't need the address, but already knew all about the man and his family. He knew when His friend Alazar (Lazarus) was sick, and the moment he died. Even with the Internet and cell phones, no other living being can know and do the things Yahusha accomplished. There is no limit to Yahusha's abilities. Teaching others to think of Yahusha as being simply a special man means we have to become blind to many, many Scriptures which indicate otherwise. Yahusha is one of 3 possible things: Master, liar, or lunatic. His actions confirm He is Alahim -- without them we may be able to suspect Him of being deluded, or a liar. When we stand before Him, we will know and sense better Who He really is; He will shake the heavens with His voice at His return, not just the Earth. We are puny creatures incapable of creating life; He is the Author of it. ". . . whatever you ask of the Father in My Name, He might give you." Yn. 15:16. "These things I have spoken to you in figurative language; an hour is coming when I will speak no more to you in figurative language, but will tell you plainly of the Father." Yahusha is holding back a great deal, so of course we currently dispute each other's understandings of His true identity and relationship to Father Yahuah. "All things that the Father has are Mine; therefore I said that He takes of Mine, and will disclose it to you." Yn. 16:15. "If you ask whatever in My Name I shall do it." Yn. 14:14. The more you study about this, the more your point of view will differ from those who haven't studied it. All things that are the Father's are Yahusha's (and this includes His abilities), Yn. 15:16. Creatures cannot raise the dead, nor create anything. The authority to forgive sins rests solely with Yahusha, and He will be the Judge of the living and the dead. Yahusha raised Alazar and others from the dead, and His Spirit in the talmidim raised the dead and healed the sick and lame. In Yahusha's Name there is found the forgiveness of sins, the power of healing, and authority over demonic spirits. Yahusha is the manifestation through which Father Yahuah reveals Himself to His creation. His behavior in us is seen by others when we love those who mistreat us. Of course when we only superficially survey the various statements made such as "the Father is greater than I" we can still misinterpret the point Yahusha is trying to convey. To the men seeing and hearing Yahusha at that time, the Person of Yahusha standing before them certainly was "lesser" in every sense of the word than Father Yahuah. He had humbled Himself infinitely to take on the form of men. His rank was below that of the messengers (Hebrews 2:7); and He came into the world He had created. "He was in the world, and the world came to be through Him, and the world did not know Him. He came to His own, and His own did not receive Him." Yn. 1:10,11. Yahuah exists not only throughout infinite space, but also time -- infinity past and future. Every moment of all time is His reality. One million years in our future timeline doesn't exist for us, as temporal beings. But Yahuah is there right now. His goings-forth are from eternity. He doesn't just KNOW the future, or the past, He is there in all times, holding all things together. He knows your inner-most thoughts and motives, and He created the spirit within you that makes you unique. His powers are unfathomable. 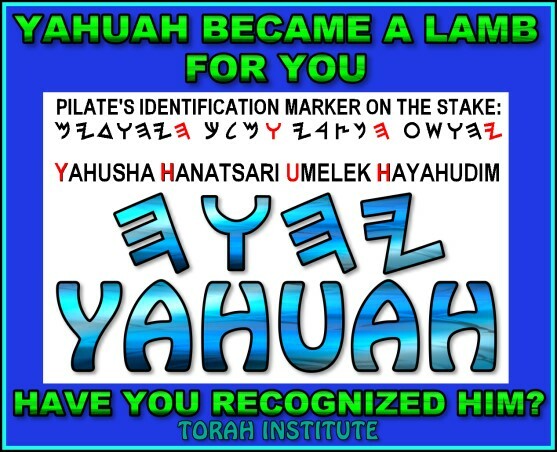 His Name, Yahuah means "I was, I am, and I will be" or 'Who is and Who was and Who is to come'. The Name Yahusha means "I am your Deliverer." He is THE Eternal Being, but He hides Himself; only those diligently seeking will find Him. He dislikes the cowardly, those who faint away and won't bear up under the scorn of man. We must endure our thorns -- those who would make it their occupation to torture us for our courage and faithfulness. Some believe it is wrong to worship Yahusha; yet Hebrews 1:6 tells us the messengers (angels, malakim) worship Him. Messengers's speaking in Scripture have said we are to only worship Yahuah. In spite of all the hints in Scripture, people resist making it all add up. "You shall not try (test) Yahuah your Alahim". Mt. 4:7. Imagine any creature making a statement like that -- including an "angel." Angels (messengers, or malakim) are creatures ~ they were created before the Earth, and the first man, Adam. The sang as they watched Yahuah create the heavens and the arets. The malakim aren't mortal (from the Hebrew muth, and Latin morte, for death). The Spirit of Truth comes in the Name of Yahusha, and Yahusha is the Truth and the Life. Mashiak is to be All in all (Col. 3:11); the objective of Yahuah is to be All in all (1 Cor. 15:28). Yahuah and Yahusha are One, not two or three. Yahusha is an aspect of Yahuah, revealing the Father to us. Many try to make "them" into a twinity or trinity, but these teachings originate from outside Scripture. When the day arrives and we stand before Yahusha, we can ask Him to show us the Father. He may have the same answer for us that He did for brother Philip, and that will be enough for me. Yahusha's omnipresence is one of the main problems for ha shatan. One of the first realizations I had when I was a child was that Yahusha is omnipresent, and that I could talk to Him. Praying to the dead is an abomination, and quite silly. 1. she's not omnipresent; 2. she doesn't speak any language but Hebrew (or the dialect of it called Aramaic), so she can't understand a word they are saying; 3. she's dead. Yahusha can hear us, He is everywhere (in the universe), and He's alive. See the subtle distinctions there? If we found ourselves in space beyond the visible galaxies, He would still be there with us. Even if much of this is a huge misunderstanding on my part, at least Mashiak is preached; see Philippians 1:12-30. Philippians 2:5-8 tells us that Alahim Yahuah took the form of a bond-servant, being made in the likeness of men. Verse 11 is the clincher. Philippians 2:13,14 tells us that it is Alahim Who is working in you -- and that we should be without grumblings and disputings, in order to be blameless, to shine as lights in the world amid a perverse generation. If Alahim is in us, and the Mashiak is in us, then we know more about Who Mashiak is. No creature can ride two chariots (or cars) at the same time, or ride two horses; yet Mashiak is in many of us right now. He's not a created being, He is the Creator. Kolossians 1:16-20: "And He is the image of the invisible Alahim, the first-born of all creation. For by Him all things were created, both in the heavens and on Earth, visible and invisible, whether thrones or dominions or rulers or authorities -- all things have been created by Him and for Him. And He is before (foremost) all things, and in Him all things hold together. He is also head of the Body, the ekklesia (Hebrew, qahal), and He is the beginning, the first-born from the dead; so that He Himself might come to have first place in everything. For it was the Father's good pleasure for all the fullness to dwell in Him, and through Him to reconcile all things to Himself, having made peace through the blood of His stake; through Him, I say, whether things on Earth or things in heaven." When the day arrives that the Children of Yahuah are revealed to the universe, and Yahusha takes the Throne, He will be the Sovereign of sovereigns, and Master of masters (Rev. 19). "For let this mind be in you which was also in Mashiak Yahusha, Who being in the form of Alahim, did not regard equality with Alahim a matter to be grasped, but emptied Himself, taking the form of a servant, and came to be in the likeness of men." Philippians 2:5-7. "Alahim, therefore, has highly exalted Him and given Him the Name which is above every name, that at the Name of Yahusha every knee should bow, of those in heaven, and of those on Earth, and of those under the Earth, and every tongue should confess that Yahusha is Master, to the esteem of Alahim the Father." Philippians 2:9-11. If Yahusha is Alahim, as I believe He is, we may worship Him and pray to Him; and whatever we ask in His Name, and according to His will, He will do it. "But let Alahim be true, and every man a liar, as it has been written, 'That you should be declared right in Your words, and prevail in Your judging.'" Yahuah claims He is the King (Melek) of Yisharal, but at the same time we find that Yahusha is also. Yahuah is the husband of Yisharal, and yet Yahusha is the Bridegroom. He's not the best-man, or number 2 in any way. Let there be no striving and fighting among us -- Mashiak is proclaimed, and that is what is most important. To some of us, He is simply more important than anything else. Ockham's Razor: After William of Ockham + RAZOR (as a sharp instrument for cutting away non-essentials). A principle in science and philosophy urging the use of the most economical and least complex assumptions, terms, and theories and stating that an explanation for unknown phenomena should first be attempted in terms of what is already known. It is usually formulated as "Entities should not be multiplied unnecessarily."